"Women's Leather Work and Garden Gloves are designed to fit the needs of today's multi-tasking woman. IDEAL FOR: All-Purpose, Gardening, DIY, Tool Use, Landscaping, Demolition, Construction, Fencing, Equipment Operation, and more. The elastic wrist helps keep out dirt and debris while slip-on design provides easy on and off flexibility. Glove is tan cowhide and features Gunn cut and Keystone thumb design for added comfort and flexibility. Grain Cowhide provides durability, comfort and excellent abrasion resistance- The ideal leather for an all-purpose work glove. Wells Lamont - Stubborn About Quality Since 1907. " Elastic wrist helps keep out dirt and debris while slip-on design provides easy on and off flexibility. 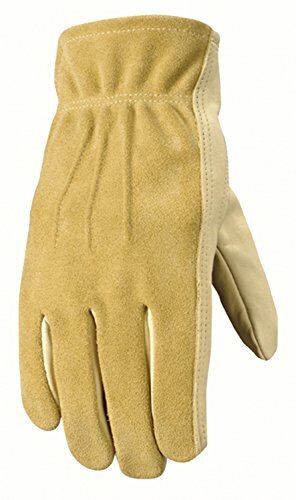 Glove is tan cowhide and features Gunn cut and Keystone thumb design for added comfort and flexibility.